However, most times, some friends on Facebook do misuse the friendship privileges by choosing to spam others or do things that always make them uncomfortable while on the site. If you've blocked people on Facebook before, you can access them any time. 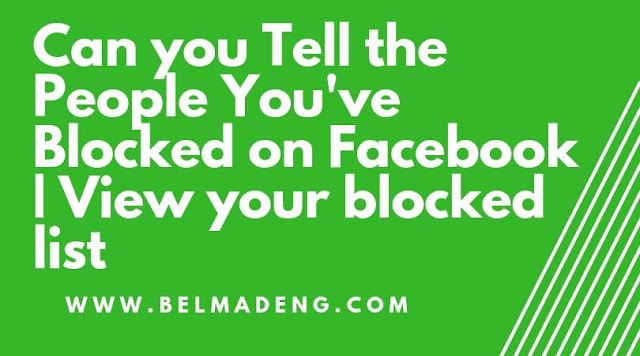 In this post, you will see how to view the list of all your blocked friends and how to unblock them. 1. Enter https://www.facebook.com in your browser and click enter. 5. Navigate to the "blocked users sections," and you should see the list of all the people you've blocked so far. Now, to see the individual persons you've blocked, enter his/her name in the space provided and then you should see them. To unblock someone you've blocked on Facebook, follow the above steps and then click the unblock button that next to the name of the person. NOTE: Blocking people on Facebook is never a taboo. If someone makes you feel unsafe on the site, you can block the person ASAP. In the same way, if in the long you resolved your differences with them, you can unblock and send a friend request again.